Helen - Solar orbiter is one of the European Space Agency's missions; part of their Cosmic Visions Programme. 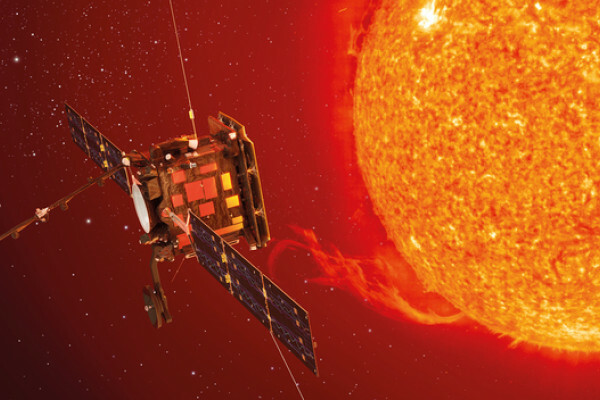 It's going to fly closer to the Sun than any spacecraft has ever gone before and it's going to have a wonderful suite of instruments which will both look at the Sun's surface through lots of telescopes in all parts of the electromagnetic spectrums, so visible light, ultraviolet light, x-rays, that kind of thing. And then it's got a range of in-situ instruments that will measure the solar wind, so the particles that stream off the sun all the time and are massively influenced by what's going on on the Sun's surface. We will actually measure those properties really close into the sun so we will be able to work out how things on the surface develop through space and how they influence space weather as it called, or what we actually see moving through space and coming off the Sun all the time. Graihagh - And we can't do that here on Earth then? Helen - We can't do that here on Earth. On Earth we're one astronomical unit away from the Sun and by the time the solar winds, this is the particles that stream off the sun get to us, they're kind of jumbled up. We've got fast wind and slow wind and those mixed up together and it's actually really difficult to then translate what we see here back to what's going on on the surface. The Sun rotates as well so that adds an extra complication. So if we get in really close; we're going to go to 0.28 au, so that's 28% of the Sun/Earth difference. It's just inside the orbit of Mercury. Then we actually get the new solar wind and we can really trace back then what's going on where we are, where the spacecraft is with what we see on the surface. Graihagh - How on earth do you build something that's going to be that close to the Sun because it's got to be.. I mean the solar wind is one thing but the radiation coming off that's got to be another? So building these instruments must be quite a challenge? Helen - It is. There's a whole lot of challenges and I think one of the main things for Solar Orbiter is dealing with the heat. You're' just that close to the Sun and mostly we rely on good spacecraft design. So the spacecraft is going to be sun pointing all the time and it basically has a huge heat shield, so a huge umbrella that it puts on the front of the spacecraft to protect it from the heat. So, essentially we'll have the hot face which looks at the Sun, which has got on the very front surface a material that's very resistant to heat, which is actually made up of ground animal bones. It's called 'solar black' and of all the inventions that man have come up, with the best heat resistant material is actually animal bone. It's basically carbon that is put on the front so, counterintuitively, the surface is black when you thought it should be shiny to reflect heat but we just don't have reflective materials that can deal with being that close to the Sun so we've got a black surface on the front. Graihagh - It's amazing to think that all these technical revolutions, and I'm looking around your lab here and it's full of an amazing array of equipment, yet we're still going back to things like ground up animal bones to do the work for us. Graihagh - And what Helen really wants to know if about the Sun's Magnetic field... but what is that? And why is she so keen to measure it? Helen - So magnetic fields are really hard to explain and they're quite abstract concepts. Here on Earth we've got a magnetic field generated by the movement of the Earth's core, which is full of iron basically. Molten iron moves around and generates a field. We've got a North Pole and a South Pole and if you look at what we call field lines, which give us structure, then its the dipole that you might remember from school. So the field lines come out of the North Pole, bend around and come back in at the South Pole. Now the area around the Earth is dominated by our own magnetic field and we call this the 'magnetosphere of the Earth'. However, the Sun also generates a magnetic field which is actually much more complicated. It goes through a cycle over 11 years and when it goes into what's known as a 'solar minimum', it has a kind of dipolar structure - one North Pole, one South Pole and the field lines look very much like they do on the Earth. But it then goes on this 11 year cycle where it moves up to what's called a 'solar maximum' and then the field is much more complicated. There's lots of local North and South Poles all over the surface of the Sun and lots of loops of field coming out. And then basically the field calms down again to another solar minimum and then at that point the field has flipped so north has become south and south has become north and that will be 11 years later. Now the Earth's field is not quite so dynamic so we basically have one North Pole and one South Pole and we've had that for many thousands of years. However, there have been periods in the EArth's history where it's also flipped and so what was north is south and what was south is north and it's generated by the iron inside the Earth's core or it's generated by the core of the Sun. And actually how the magnetic field develops as it moves out through space tells us a lot about how energy is redistributed. And one of the great mysteries of the Sun which is why the atmosphere of the sun which is called the corona, which is what we see when we get a solar eclipse, is actually hotter than the surface of the sun. That's a really counterintuitive thing, you'd expect the surface of the Sun to be hot and as you move further it to be cooler but that's actually not the case, and we think that the reason for this is through magnetic energy heating the corona. If we try and understand this magnetic field, which is really quite complicated, but if we try and understand it then it really will tell us more about how energy is transmitted from the core of the Sun out to the atmosphere or the corona, and then out through space. Graihagh - So tell me a little bit about your instrument? What are you working on? Helen - So we're building the magnetometer; it measures the magnetic field. We actually put our sensor out on a long boom away from the spacecraft because everything on the spacecraft will generate magnetic fields. If you've got any kind of currents flowing, any kind of magnetic materials, they all generate magnetic fields. And the fields we want to measure are actually really tiny so the unit of magnetic field is the tesla. The tesla is one of those crazy units which is actually really, really big so there's very few things that have a field, or generate a field of 1 tesla. We deal on the surface of the Earth with microteslas, so that 10 to the minus 6 tesla, and it's about 60 microtesla on the Earth's surface. We want to go down to fields of 10, 20 nanotesla, so really really tiny, 10 to the minus 9 tesla. So the real challenge for us is trying to measure those fields accurately, and also to remove any contamination we get from the spacecraft. Graihagh - Why do you want to measure such small fields? What is it about them that's really interesting? Helen - The magnetic field is just a fundamental property of the solar wind and it really helps us to give order and structure to the solar wind. If you know what the magnetic field is doing, then you know the direction charged particles are moving in, for example. You can see how the solar wind and the energy from the Sun developes through space, so it really is like we use the magnetic field on Earth to help us to navigate around. The magnetic field in space really helps us navigate the solar wind we're seeing and gives it direction and order basically. Graihagh - Can we see your instrument and what you've been working on for the last seven years, is that right? Helen - So here we have an electronics board which is actually our lab model. This is the same electronics that we're going to fly but it's on a circuit board where it's spaced out. So you can see we've got various probes and we're looking at the signals at various stages and trying to make sure that we eliminate any kind of background noise so that we can just measure the signal that we want, which tells us about the magnetic field. Here I've got a sensor. So the sensor weighs about 500 grams and that actually kind of fits in the palm of your hand, and we've got two cores to measure the field in three directions. Graihagh - And just to describe it. I mean this looks like a circuit board; it looks like something that might be in my computer at home. Graihagh - It's even got a VGA cable or what looks like a VGA cable to go into the back of the TV. Helen - Yes. The VGA cable is actually our sensor cable but, yes, a similar thing. The sensor gives us a very tiny signal in volts and what this electronics in front of you does is it extracts the field so we measure the magnitude of that signal in volts and its phase relative to a drive signal that we put in and that tells us about the magnitude of the field and the direction. Graihagh - Presumably this would all be boxed up because I'm thinking it's a remarkable journey it's got to take in the first place? I mean just getting of Earth is quite a bumpy ride. Helen - That's right. One of the big problems for Solar Orbiter is that it's quite a small spacecraft but it needs a huge Delta V to get as close as it needs to go. So it's on a really big rocket (an Atlas 5 rocket) so the vibration it experiences in launch is really quite intense. We put these electronics boxed, we make them as compact as we can. We put them inside a frame and the frame has to have a certain thickness of aluminium because we do get radiation in space and if you think a lot about what comes off the Sun: charged particles, electrons - electrons are what flow in an electric circuit. So if you mix up electrons flying in from the Sun with what's going on in your circuit, it can disrupt what's going on. So we do have a certain amount of shielding from our box which is made of aluminium. But we also use electronic components that are specially designed to resist, to be what's called radiation hard, and so to be able to deal with being bombarded with charged particles and still operate as they're supposed to. Graihagh - So you're in the testing phase now and seeing whether it might be able to withstand these vibrations, and the radiation, and things? What's the next step - when's it going to launch? Helen - We are working on what's called our qualification model, which is the model that we build exactly the same as the flight model but we overtest it. So we put it through horrendous vibration, thermal cycling, so we're really quite horrible to it, and at the same time we're building our flight model. So we've initiated that now and some of our boards are in population and, by the end of the year, we hope to deliver our flight model to the prime contractor's, that's the people who are making the spacecraft, that's Airbus up in Stevenage. And then two years late, October, 2018, it will launch from Cape Canaveral. Graihagh - Are you going to be there? Helen - I certainly hope so. That's my intention, yes.